Although a violinist by trade, fulfilling the role of second violin in the Czech String Quartet, Josef Suk was also, by all accounts, an accomplished pianist. He had studied under Antonín Dvořák, whose daughter Otile he married in 1898. Sadly, she was to die prematurely in 1905, barely a year after her father. The selection of piano works featured on this new Hyperion release by the British pianist Jonathan Plowright span roughly a decade, the years 1891-1902. 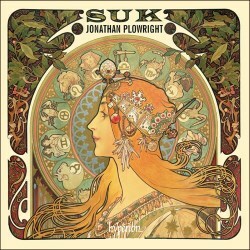 Suk's piano music is relatively small in scale; much of it fits into the salon category. Its primary attractions are the generous lyricism and lush harmonic textures which saturate the pieces. There is often an elegiac thread. I was amazed how virtuosic a lot of it is, and how it makes considerable demands on the performer. A wealth of imagination and skill is revealed in what are essentially romantic character pieces. The composer chose picturesque titles, in much the same way as Schumann, Smetana and Dvořák had done before him. The earliest works on the disc are the seven Piano Pieces Op. 7, penned in 1891-1893 and published as a group in 1894. Probably the best known is the Song of Love, which was the last to be written. Plowright builds it up from a langorous beginning to a climax of fervent, glowing intensity, before returning it to a dreamy conclusion. Recollections is steeped in wistful nostalgia, and Dumka begins with a funereal tread before a noble central section. Idyll 1 has a quaint salonish charm, whilst Capriccietto, which ends the set, is light, affable and good-humoured. Moods, Op. 10, which end the disc, followed in 1894-1895. Of the five pieces, Legend is the most expansive in scale. It is the longest piece in the collection at over seven minutes. It is epic in proportions and rhetorically eloquent in style. A jaunty Capriccio follows. Its fun-loving character proves some light contrast. I personally like the Romance, which is tender and winsome. The last piece, which ends the disc, is Spring idyll, to which Plowright brings plenty of zest and effervescence. Spring and Summer Impressions date from 1902. The two cycles share the opus number. This can be accounted for by the fact that it was the composer's original intention to represent all four seasons, but he never got around to Autumn and Winter. The eight pieces were composed against a backdrop of the contentment of marital bliss. The opener, Spring, is exuberant and joyful, whilst The Breeze is quicksilver and mercurial. Awaiting and Longing are more passionate, with a romantic sweep. In Summer Impressions, no-one can fail to be won over by the unbounded energy of the fun-loving and sprightly Children at play. By contrast, in Evening mood a restful calm pervades. Jonathan Plowright mines the lyricism and melodic treasures of these wonderful pieces in compelling fashion. His technically assured, stylish and idiomatic performances will, I am certain, win these works many friends. The Potton Hall acoustic provides warmth and intimacy, and facilitates Plowright's multifarious colouristic range to perfection.